The history of the Costa del Sol is a mosaic of Phoenician, Greek, Roman and Moorish conquests, each having left their cultural and architectural footprints across its semi-tropical landscape. The province of Malaga is home to some of Spain’s finest beaches, tapas restaurants and flamenco shows, as well as being the birthplace of bull-fighting. 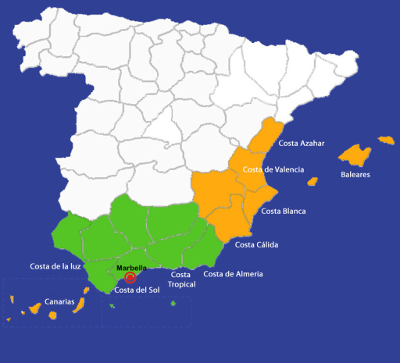 Consisting of coastal towns and communities the Costa del Sol, which in English means the “Coast of the Sun”, is said to have the best weather in all of Europe. The warm climate, infrequency of rainfall and the sea breeze make for semi-tropical vegetation in which palm and cypress trees flourish. In the summer, temperatures often reach a scorching 40°C, attracting sun-seekers from all around the world, while winter conditions are also pleasant, staying far milder than most other areas of the continent. Popular for its beaches, culture and laid back lifestyle, this region of Spain caters for young and old alike and offers a wide range of lifestyle, entertainment and social options. Often dubbed “The Costa del Golf”, it boasts one of the highest concentrations of world class golf courses. For families there are theme parks, including water parks, go-karting, safari parks and many beautiful public gardens. For younger visitors the main areas of attraction are Marbella and Puerto Banus, where the chic and trendy mingle with the rich and famous, filling the bars and clubs from midnight ’til dawn. Overlooked by the “La Concha” mountain and surrounded by rustic ˜white villages”, these two coastal towns are among the most glamorous and stylish seaside destinations in the world.